At Ashbrook Roofing, our wide selection of high-quality, affordable materials include professional grade roofing felt adhesive. 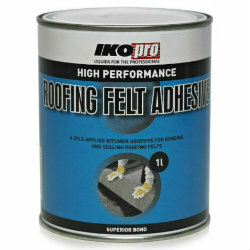 Roof felt adhesive is an effective alternative to nails to secure roof felt to a structure. The adhesives in our selection are suitable for bonding felt to concrete, timber, metal and asphalt, and can be used with bitumen and polyester-based roof felts. The UK weather can be pretty unpredictable, so we’ve selected the highest-quality adhesives available to make your structure watertight and secure. We provide roofing felt adhesive in varying quantities, with everything from cartridges to 25-litre cans, suitable for roofing projects large and small. And regardless of whether you’re a professional roofer, a self builder or a DIY enthusiast, we’ll offer the same fantastic trade prices on all of our products. Why not take a look at our extensive selection of roofing felt while you’re here? With everything in the one place, picking up your roofing materials has never been simpler. Order your roof felt adhesive online today from Ashbrook Roofing. We can even get your items to you by the very next day, when you order before 2pm.